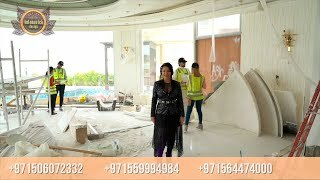 Villa Design in Dubai from Luxury Antonovich Design is the creation of the ambitious project with beautiful and original features. The light color of the space creates a comfortable and welcoming atmosphere. Everything is filled with extraordinary gentleness and ease. Home decor Dubai is elegant and airy. You can feel how the harmony and beauty fill every cell of your body in this atmosphere. Modern villa design from the design company Luxury Antonovich Design is an elite home furniture Dubai with high-quality upholstery, beautiful marble floor with elegant patterns, correctly well-though-out lighting, the unique gold frames, mirror reflexion on the walls and an abundance of the decor elements. The extravagant curtains play an important role in the villa design in Dubai, which make a magnificent decoration of the window, and the house more comfortable and beautiful. Luxury Villa in Abu Dhabi, it is feast of luxury and festivity. It is the dream of many admirers of beautiful interiors. The talented professionals of the design studio Luxury Antonovich Design create a warm and joyful moments that will fill your home with comfort and coziness. Top interior design firms Dubai embody the most original projects that combine the grandeur and elegant mood. These projects represent the future of modern architecture and design. Villa Design in Dubai is a confirmation of the exclusive interior design with the bright character. The architectural and design company Luxury Antonovich Design will highlight your status, aristocracy and nobility.